At $6,600, Might This 2001 Nissan S/C Crew Cab Pickup Be Your Final Frontier? Today’s Nice Price or Crack Pipe Frontier represents one of the last of the compact pickup trucks sold here. We’re going to see if this supercharged Crew Cab’s price will make it contrastingly big on value. The word Ion is derived from the Greek ióv meaning to go, and is commonly used in scientific parlance to refer to an atom or molecule with an unequal number of electrons and protons. It was once also picked as a model name for GM’s now moribund Saturn brand. Yesterday we had just such an example, a 2004 Saturn Ion Quad Coupe Redline. That, as the name so clearly implies, has a door and a half on each side, and an engine that likes to live racing around its tach. Those are each compelling attributes, and they overcame a few niggling issues, like the need for new tires and a wonky parking brake, to give the clean car’s modest $2,800 price a decent 68-percent Nice Price win. I guess you could say that the car was unequally electrifying and proletarian. How do you ascribe nationality to a car or truck—by that of its brand, or by where it was actually built? Is a Volkswagen Jetta a German car, or is it Mexican? Ford is perhaps the most American brand there is, however their Transit Connect compact van is built in Spain, even for American consumption. Would driving one while hungry give you pangs for hot dogs and apple pie or for paella? I ask this because today’s 2001 Nissan Frontier S/C Crew Cab comes from a Japanese brand, but its final point of assembly was a factory in Smyrna, Tennessee. That plant is one of the largest auto manufacturing concerns in the nation, and makes Nissan Smyrna’s top employer. While the semantics of its origin might be debatable, the fact that the Frontier is one of the last of the compact pickups sold in America goes without argument. This one, in Just Blue Metallic over a black leather interior wears its big boy pants in the form of a four-door crew cab body. Behind that commodious cabin is a bed that, at 54.7-inches, is a full 20-inches shorter than the basic bed in the King or Standard Cab models. A flip-over aluminum gate was available for these trucks that could extend the available load space over the dropped tail gate, but that’s an option box this truck’s original buyer apparently did not check. Better I guess was the choice of optional engines as this 170,000 mile Nissan is pulled by the 210 horsepower VG33E with Eaton supercharger. Behind that is a four-speed automatic and a limited slip diff in the back. The truck is a four-by-two. The ad notes a recently completed refreshing of the engine’s major consumables, including the timing belt and all the port gaskets. It’s deemed by the seller to be ready to rock with this work under its belt, needing just a twist of the key to fulfill all your Frontier fantasies. The bodywork is decent, but just so. The seller notes some paint flake, and the rear step bumper is a bit dinged up, albeit straight. There’s no rust anywhere, at least not that can be seen. The plastic bed liner could be masking a pandora’s box of badness but this being a Southern California truck I think that’s highly unlikely. Inside things are similarly well sorted, with only some rumpelstiltskin on the driver’s seat to show its age and use. A moon roof fancies it up a bit, but does make using the roof rack a bit of a dodgy proposition. I think that had the Griswolds driven one of these in National Lampoon’s Vacation, Clark would have thought twice about putting Aunt Dead-na up there if he had to stare at her all day. These were weird little trucks. The supercharged V6 made decent power, but at a little over two tons the truck’s still a lot to carry around. That means fuel economy is going to be pretty abysmal. Making up for that will be the supercharger whine, and everybody loves that, right? 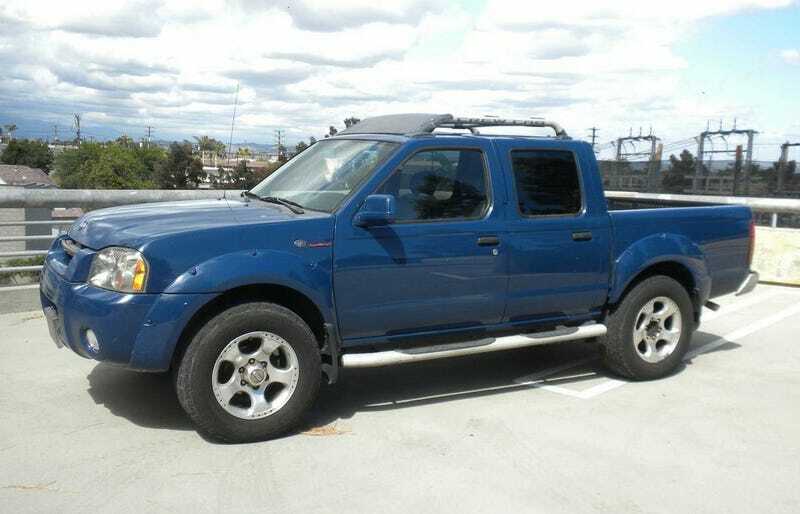 You may also love this truck’s price too, which is $6,600 with its smog certificate included. This is California after all. What’s your take on this truck and that price? Does that make you feel the deal? Or, does that make this a Frontier you you wouldn’t explore? At $2,800, Could This 2004 Saturn Ion Quad Coupe Redline Put You Over The Moon?